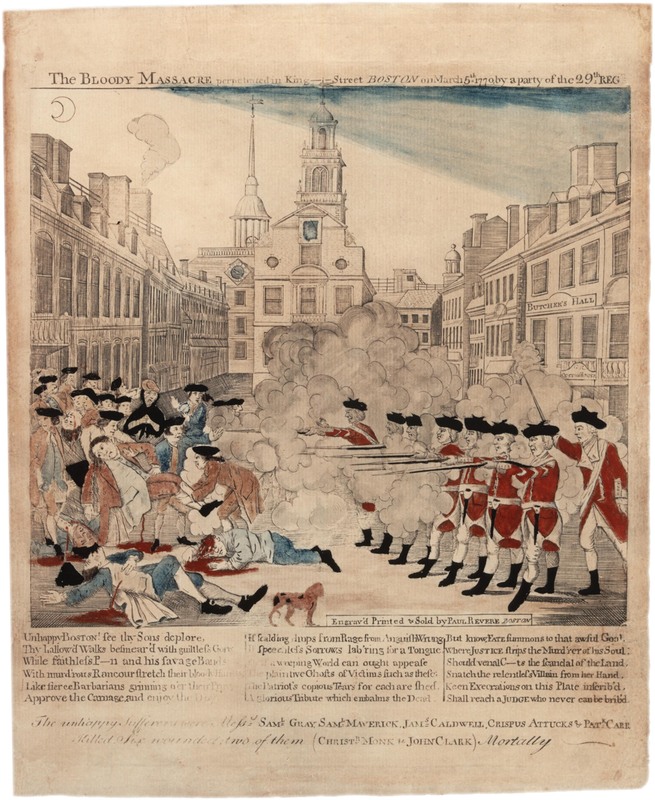 "The Bloody Massacre" engraving by Paul Revere. Note that this is not an accurate depiction of the event. The presence of British troops in the city of Boston was increasingly unwelcome. The riot began when about 50 citizens attacked a British sentinel. A British officer, Captain Thomas Preston, called in additional soldiers, and these too were attacked, so the soldiers fired into the mob, killing 3 on the spot (a black sailor named Crispus Attucks, ropemaker Samuel Gray, and a mariner named James Caldwell), and wounding 8 others, two of whom died later (Samuel Maverick and Patrick Carr). A town meeting was called demanding the removal of the British and the trial of Captain Preston and his men for murder. At the trial, John Adams and Josiah Quincy II defended the British, leading to their acquittal and release. Samuel Quincy and Robert Treat Paine were the attorneys for the prosecution. Later, two of the British soldiers were found guilty of manslaughter. 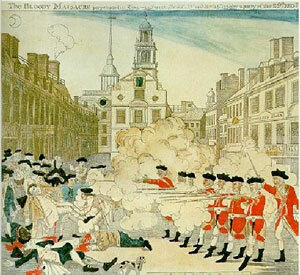 The Boston Massacre was a signal event leading to the Revolutionary War. It led directly to the Royal Governor evacuating the occupying army from the town of Boston. It would soon bring the revolution to armed rebellion throughout the colonies. Note that the occupation of Boston by British troops in 1768 was not met by open resistance.